WooChess is proactive education platform which helps to learn chess online. It is the only chess study platform that offers a full repository of chess resources. It helps people who are passionate about chess and want to learn everything about it, find professionals who are ready to share their expertise. There are over 600 million chess players in the world and according to Google Search, there are about 10,000 searches per month on how to learn chess. There are thousands of websites offering to learn chess online, but none of them offers unlimited opportunities like WooChess does. Let’s explore what WooChess offers for you and find out why it is one of the bests. First of all, WooChess offers to register as teacher or student. If you are a teacher you have a huge number of choices on making your lessons. 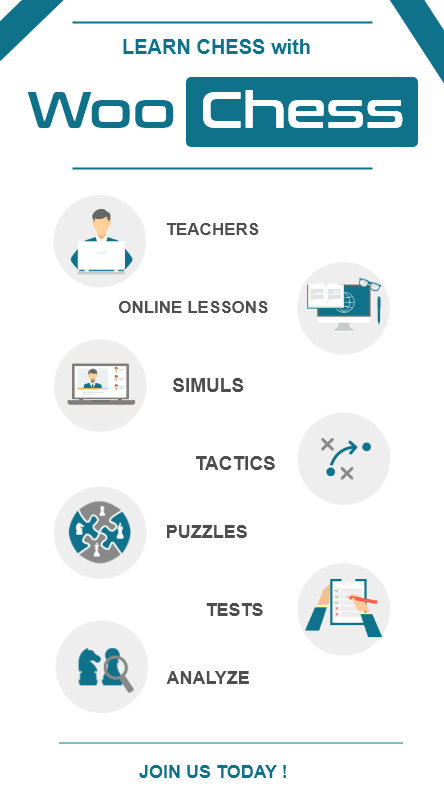 You can create simple written lessons and tactics; make your own puzzles, quizzes, and video lessons. If you are a student you are lucky to have a huge library of resources available on the website. The first things you need to learn in chess are moves. There is a wide range of offers for beginners, huge information about openings, middle games, endgames and even psychology of the chess. Tactics contain a big number of problems, which are good for brain training. They show your mistakes and the right solutions, helping you to boost your knowledge of chess. In puzzles page, you can find easy, medium and hard online chess games. This makes your fun atmosphere, helps to relax and enjoy. Video lessons uploaded by professional chess players help to fully understand the required information. The lectures are mostly prepared by Armenian grand-masters, with a passion for sharing knowledge and experience. After successfully finishing each lesson students can take online quizzes, get it checked and graded immediately after completion. This I like the most. Students can have online lectures with their teachers by video chat, ignoring distance and any inconvenience. Finally, you can always invite your friend to WooChessl to play chess together and have a good time. WooChess opens a huge world to you, where you can discover chess, the most intellectual game in the world. It has been developed for the purpose to make the studies very comfortable, easy and fun. Whenever you are in WooChess you will not need any other chess source outside of the website. And remember “Every chess master was once a beginner.”- Chernev. From the beginning the mission was simple, to connect chess lovers and help users on studying chess, making the teaching system fun, as well as valuable. AIST team of chess lovers brainstormed for several days and come up with the WooChess idea. The website made with love and enthusiasm by programmers who are passionate about chess. Get started right now and learn chess online with WooChess!